What effect does eliminating these expenditures have on GDP, jobs, and federal revenue? What would be the effect on GDP, jobs, and federal revenue if the static savings were used to finance tax cuts on a revenue neutral basis? For an overview of the project, click here. For links to articles from the rest of the series, click here. Reduce hourly wages by 5.3 percent. Reduce hourly wages by 4.2 percent. Long-term capital gains and qualified dividends (paid out of after-tax income by corporations subject to the corporate tax rate) received by individual taxpayers are taxed at preferential tax rates. These are zero for taxpayers whose other income puts them in the 10 percent and 15 percent tax brackets, 15 percent for taxpayers in the next four income tax brackets, and, since the January budget agreement, up to 20 percent for the highest bracket taxpayers. Treasury and the Joint Committee on Taxation regard these differential tax rates as tax expenditures while admitting the purpose of the lower rates is to offset some of the double taxation of corporate income and the income tax bias against other forms of saving. A conventional static revenue estimate, which assumes away tax-induced growth changes, might suggest the federal government would collect more revenue by taxing capital gains and dividends as ordinary income. When growth effects are added to the analysis, however, the higher revenue disappears. 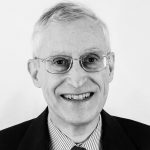 Ending the individual income tax's rate cap on long-term capital gains and qualified dividends would reduce capital formation, productivity, and wages to such an extent that it would be a major revenue loser for the federal budget. Few tax increases would actually cost revenue, but the capital gains (and dividend) tax is one of them. Our first simulation was run under the conventional revenue estimation assumption that tax changes have no effect on macroeconomic aggregates. 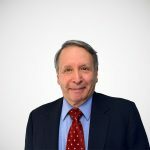 With this static assumption, the model estimated that eliminating the zero, 15, and 20 percent rate caps and treating capital gains and dividends like ordinary income would generate $108 billion, based on 2008 data with dollars amounts adjusted to 2012 levels. (See Chart 1.) This is virtually identical to the JCT's estimate of $108.4 billion for 2012 (rising to $160.8 billion for 2013), although there are enough differences in the models' structures and data that the almost exact correspondence should be regarded as a coincidence. The conventional analysis is incomplete, however, because the tax change would generate a very large percentage increase in the tax rate on the returns to capital at the margin, and the desired capital stock is extremely sensitive to its expected after-tax return. The Tax Foundation model predicts that after a several year adjustment period, the capital stock would be 16.9 percent less than otherwise, work hours would be about 1.25 percent less, and GDP would be 6.3 percent lower than otherwise. Because tax collections depend on the size of the economy, these anti-growth effects would be expected to have a negative feedback on tax collections. 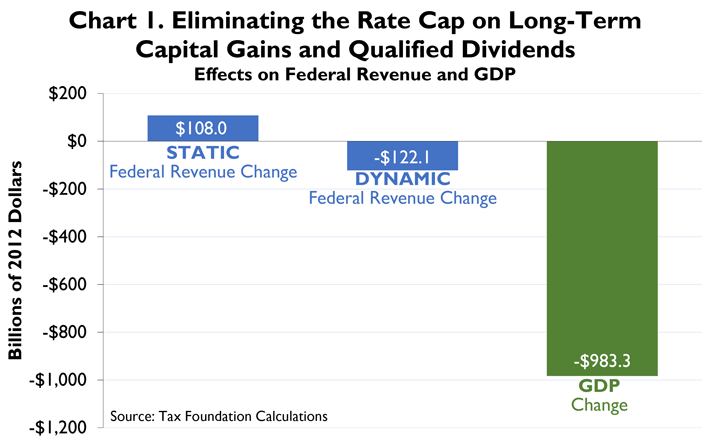 When our model takes the smaller economy into account, it estimates that ending the rate cap on long-term capital gains and qualified dividends would actually reduce federal revenues by $122 billion. 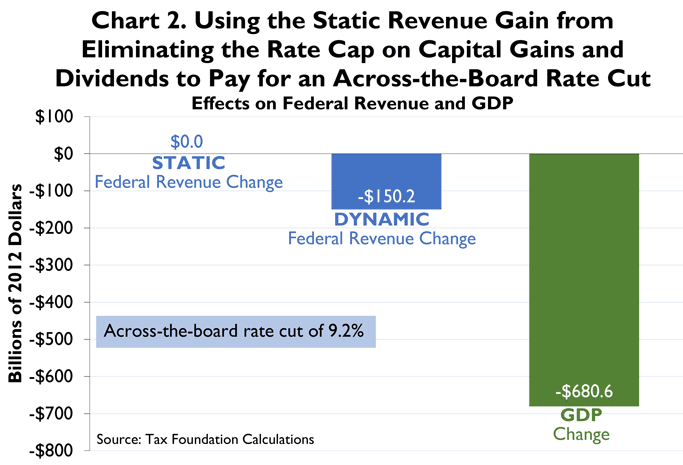 As Chart 1 shows, while the static revenue yield of $108 billion may look inviting, the dynamic estimates—$122 billion less federal revenue and $983 billion less GDP—suggests this tax change would be all pain and no gain. What would be the results if the illusionary static revenue gain were counted as though it were real and used to finance an across-the-board cut in tax statutory rates? Chart 2 shows the dynamic revenue estimates of our model. Tax rates could be cut 9.2 percent. (For example, the current 25 percent could be dropped to 22.7 percent, a 9.2 percent reduction.) The rate cuts would lower marginal tax rates, leading to greater capital formation and more work effort. The economy would benefit, and that would have some positive feedback on tax collections. These benefits from the rate reductions would only partially offset the losses from the higher tax rates on capital gains and dividends. The model estimates that if the rate cap on capital gains and dividends is ended but the static revenue yield is directed into an across-the-board rate cut, GDP would fall by $681 billion and federal revenue would drop by $150 billion. Although the rate cut would cushion the output plunge and partially pay for itself, the end result would still be a smaller economy and less federal revenue. From the perspective of economic growth and federal revenue, it would not be sensible to trade the rate cap on capital gains and dividends for lower tax rates. It would be wiser to leave the cap in place. It is likely the revenue loss from ending the capital gains and dividend relief would be even worse than the numbers shown above, because our model does not incorporate the lock-in effect. 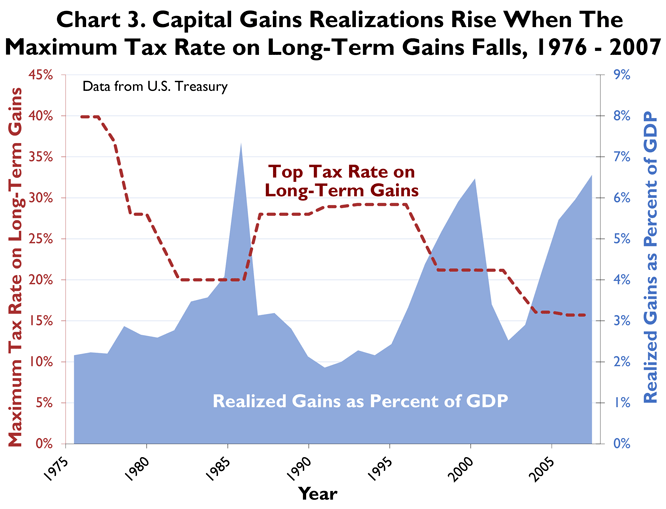 People are taxed on capital gains only when they realize them, and when the tax rate goes up, people sell their capital assets less frequently. The model also does not incorporate the fact that higher tax rates on capital gains and dividends would be reflected in reduced asset prices, which would mean smaller capital gains and, hence, less capital gains tax revenue. It also does not reflect the likely reduction in dividend payments by corporations if the tax rate reverts to ordinary tax levels, reversing the surge in dividends since the reduction in tax rates on qualified dividends in 2003. The realizations effect, which is the sort of taxpayer behavior the revenue estimators are supposed to take into account even under static analysis, proved much larger than they anticipated. It was enough by itself to reduce revenue even without counting the economic damage from the higher tax rate on capital income and the resulting decline in GDP. The economic damage calculated in our model run shows only the economic damage, not the further revenue loss from the reduced realizations and dividend payout effects. In more recent years, the recession of 2001 reduced realizations. The capital gains and dividend cuts in 2003 boosted realizations and stock prices sharply. The latest recession reduced gains. This is consistent with the earlier realization behavior. Finally, we determined the impact of these scenarios on employment and wages. We found that simply eliminating the preferential tax rates for capital gains and qualified dividends would reduce employment by the equivalent of about 1.3 million full-time workers and cut hourly wages by 5.3 percent. With the rate cut offset, employment would decrease by the equivalent of about 300,000 full-time workers and hourly wages would fall by 4.2 percent.